If you live in the San Francisco Bay Area, tap this stylish online marketplace for easy-care houseplants that come in a variety of sizes and types. Designed to align your plant selection with your decorating goals, the shopping experience conveniently pairs each plant with a curated selections of containers–all for one bundled price. Your plants will be delivered straight to your door, along with care instructions. And if you’re feeling a bit green thumb-shy, fret not: should something go wrong within the first 30 days with your new plant baby, Léon & George will replace it. That’s right. This online source for all things “Plant Parenthood” (love!) delivers nationwide, but also has a brick and mortar presence with two locations in Manhattan and one soon coming to L.A. What you’ll find online: a wide selection of on-trend plants, chic planters, and all the essentials for helping your greenery flourish. The Sill also offers a monthly subscription plan: for $35, you’ll get a new low-light, pet-friendly, or perfect-for-beginners plant delivered to your door, carefully chosen by their knowledgeable staff (who also provide a number of plant care tips on their site). One of our favorite online sources for all things garden and outdoor living, Terrain happens to have a gorgeous collection of potted plants that work well indoors, from succulents to mini topiaries to florals. Bonus: Come for the houseplant selection, stay for a world of inspiration for nature-based decor and gardening supplies. P.S. We’re fans of their book, too. 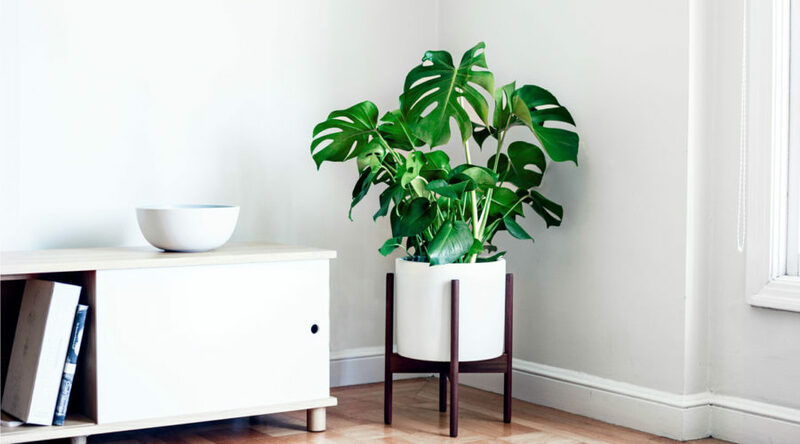 A plant delivery service that wins for simplicity, Bloomscape offers a modest yet solid selection of plants that each come delivered in a terra cotta pot. Plus you’ll find invaluable advice at the ready from their resident “Plant Mom,” who’ll answer your pleas for plant care help via social media or email. If you’re all about succulents, this is the one-stop shop of your dreams. Browse for the trendy plants by type, size, color palette, or feature (there’s even a “Weirdos” category). Want the experts to make the hard decisions for you? Opt for a one-, three-, or six-month subscription and get a new plant delivered to your door. Leaf & Clay also features a selection of affordably priced, super-cute pots made for ‘gramming. We’ve been longtime fans of this Portland-based plant emporium, and we recommend their online plant selection for those who don’t live within reach of the Pistils Nursery brick and mortar experience. Shop for standard houseplants, mounted staghorn ferns, kokedama kits, and more quirky-yet-stylish indoor plant-based decor. Speaking of stylish, their planter selection is on point, too. With plant collections specifically curated for urban dwellers, Horti primarily serves the NYC area but also extends their service beyond the Big Apple and offsets the shipping cost by packaging empty pots with dehydrated (in other words, lighter) soil. Choose a monthly subscription of plants that are pet-friendly, perfect for newbies, targeted to a plant “hoarder” (ahem, we prefer the term “collector”), or includes “naked plants” (just the greenery, ma’am!). No matter what plan you choose, you can bet on some nice-looking live additions to your home. It’s only natural that the mega-online retailer had its own dedicated houseplant storefront. We’re impressed with their selection, too–it doesn’t just include the usual suspects you typically see sprinkled around offices (not that there’s anything wrong with those). Find air plant collections, funky ferns, boldly patterned prayer plants, and a lot more. The one drawback is a lack of curation, so beginning plant owners might feel a bit overwhelmed with the shopping experience.